They really do work and can be totally startling if no one has seen them before. A load of psychics (I almost typed "fake psychics," but what's the difference?) have used these gimmicks to prove something or other. And I even saw a couple of these used in some infomercials recently. A con artist selling a magnetic rubber band ionizing bracelet (or some other piece of junk) was showing how someone who didn't wear one could be knocked over with a feather, but someone who was wearing the bracelet was turned into Captain Marvel. Anyway, try these stunts on your friends! And then see if they can explain how they work. Better yet, try to sell them the secret formula that's given you super-strength! Just talk a lot about the magnetic coherence of their chakra's infundibulum and things like that. You can just make it up as you go, they'll never know the difference. Maybe you can even start your own religion. By the way, these things are even more impressive if you get a kid to do them. Little girls are especially good matched up with that muscle-bound hulk who works out at the gym 7 days a week and gives you such a hard time. 1. It's almost impossible to lift a single hand from the top of someone's head. If both hands are clasped with the fingers tightly locked and held firmly down on the head, the entire body can be lifted by pushing upward under the arms at the wrists. 2. This one never fails to flummox people. Place your hands firmly against your chest with your fingertips just touching. If your victim holds your wrists, it'll be all but impossible to pull your hands apart (a steady pull is required: sudden jerks aren't allowed; but who likes sudden jerks anyway?). 3. Have the big goon you've been impressing put their fists together, one atop the other, as hard as they can. You can knock them apart with your fingertips. 4. This is the one all the psychics love! It really looks like a genuine feat of levitation! The lighter the subject and the stronger the lifters, so much the better. It still looks amazing. 6. 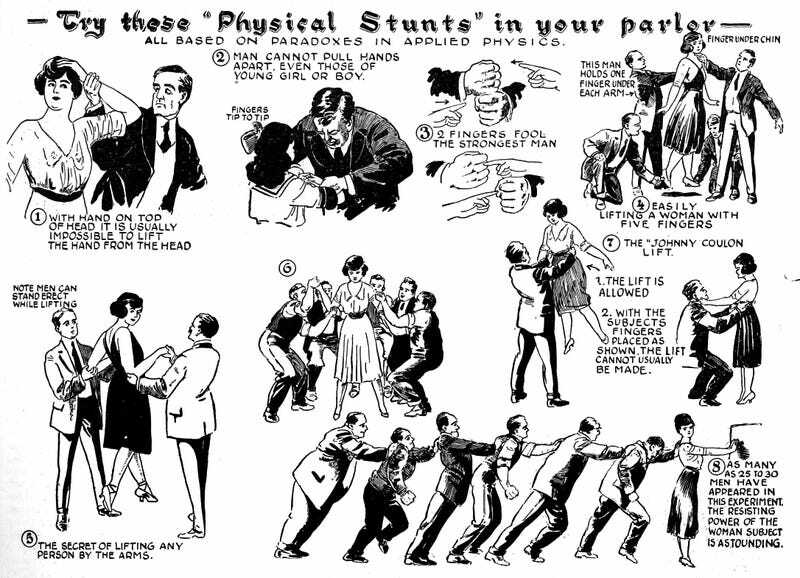 Half a dozen strong men can't lift even a girl if they try it with her arms held in the position shown.